The Wine Shoppe at Green Hills | Just Released: 2014 Silver Oak Napa Valley Cabernet Sauvignon! 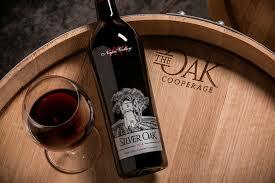 07 Feb Just Released: 2014 Silver Oak Napa Valley Cabernet Sauvignon! For 40 years, Silver Oak has been producing exceptional, food-friendly Cabernets that are extensively aged to be drinkable upon release. The 2014 Napa Valley Cabernet Sauvignon is no exception. This latest vintage has a classic opaque crimson color with a purplish hue. The alluring nose draws you in with notes of cassis, black cherry, pipe tobacco, salted caramel, cocoa beans and fresh strawberry. This full-bodied wine enters with a depth of flavor and offers mouth-coating, velvety tannins and flavors of cream soda and red fruit. Black currant and vanilla notes crescendo through the palate to the lengthy finish. This wine is drinkable upon release, but given proper cellaring conditions, can be enjoyed through 2040.